Portland Green is the Newcastle's buzzing student village. The largest student community in Newcastle, our campus comprises 5 modern buildings providing everything you need to enhance the university experience. Each building is built to the highest industry standards and has a range of facilities to ensure our residents' needs are fully catered for. Our oldest building is just 4 years old and our newest is opened this September, but whatever building you choose to live in you'll still be a part of the same Portland Green family and are guaranteed a warm welcome, comfortable living environment and exceptional customer service. 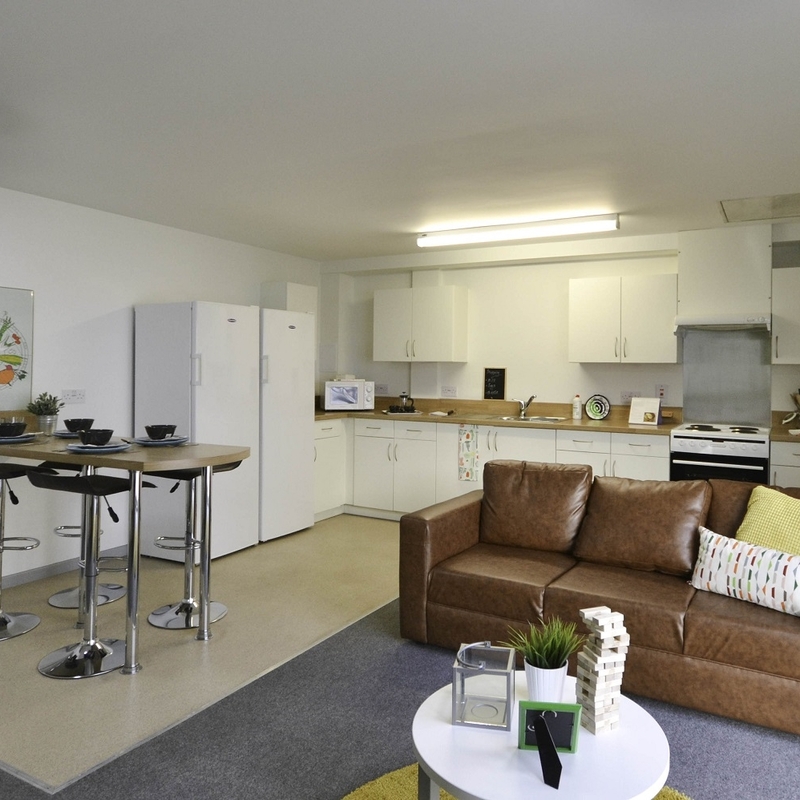 All of our buildings contain cluster flats of 4-7 beds - with Standard, Standard Plus and Premium rooms - and Standard and Premium Studio apartments. Here's a breakdown of what defines each of our buildings, to help you choose the best accommodation for you and your budget. And after you've decided where you want to live, head back to our Rooms & Prices page to book. Brand new for 2018, Newton Court offers a range of stylish cluster flats kitted out with Smart TVs, dishwashers, stylish Karndean wooden-effect flooring and all the latest mod-cons. Book now and all en-suite rooms come with £1,500 cash back and our studio apartments with £650 cash back. This building contains the main reception area for the Village and our large social area where we have most our social events, and where residents can come and relax, have a coffee or study in our specially built pods. Bryson also had a laundry and comes with £1,500 cash back on all en-suite rooms. Marshall is another brand new building which opened in September. Already very popular with residents, this building has TVs in the spacious lounge/diner, dishwashers and large Premium rooms. We have en-suite rooms which come with £1,500 cash back and limited number of studios still available with £650 cash back. Rosedale Court opened in 2015 and currently offers the most affordable room option with a Standard room starting at £95 per week. Rosedale Court is also the home to PGSV's new Fitness Suite. This building is always a popular choice with new and returning students due to it being such an affordable living option offering exceptional value for money. As an accommodation partner of Newcastle University, Turner Court can be booked directly via the university accommodation website. This building has an on-site social space, laundry and very easy access to the on-site Tesco Express.